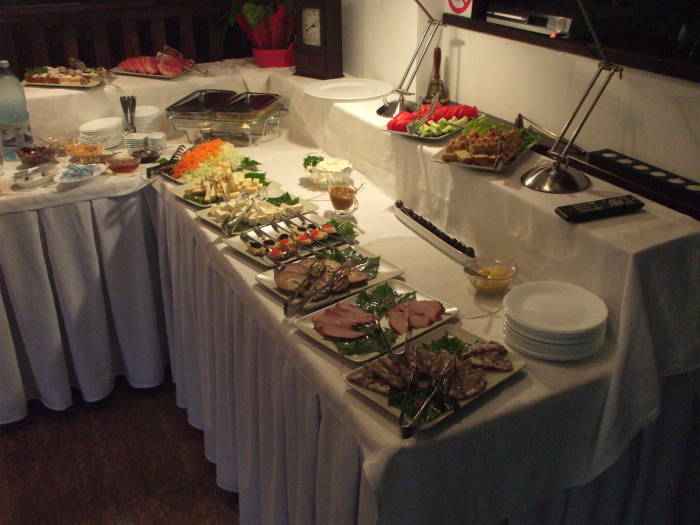 The cuisine of Romania has been influenced by the many powerful nationalities surrounding the nation. The Ottoman Empire had a large influence, but the Hungarians, Russians, and others have also left their gastronomic mark. Clear evidence remains in the names of the dishes. 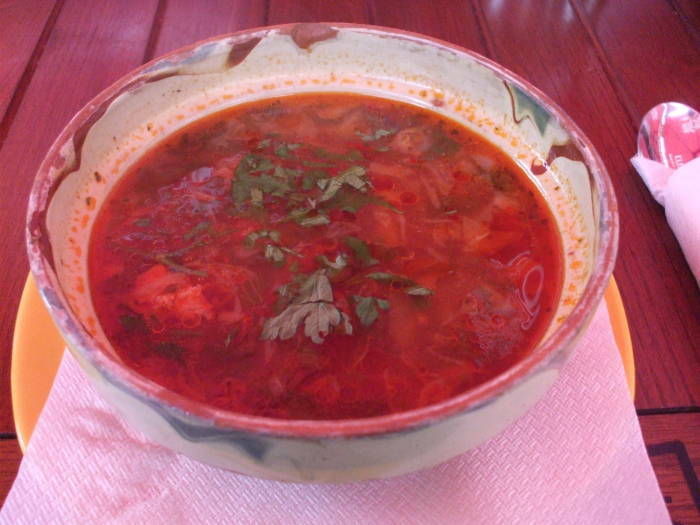 Ciorbă is the Romanian term for a category of soups with a characteristic sour taste. Compare that to the Turkish word for soup, çorba. 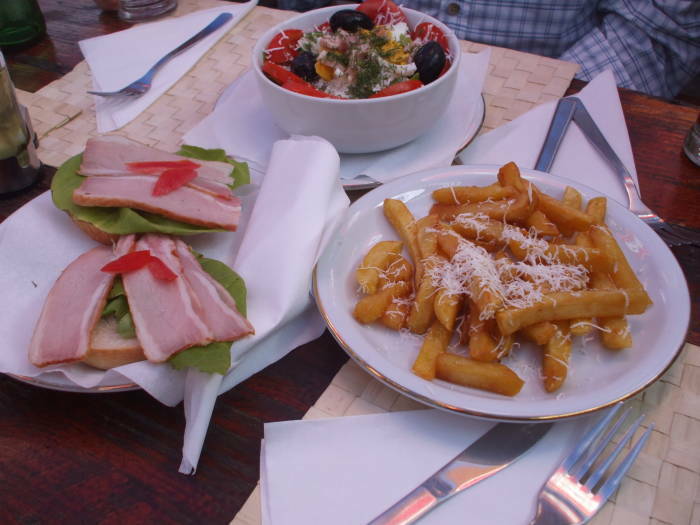 Any knowledge you have of French or Italian food terms will help, given the Romanian language's Latin base. You will recognize legume, salată, boeuf, and many more. You might start with a salad, or it might be so big that it makes up the entire meal. 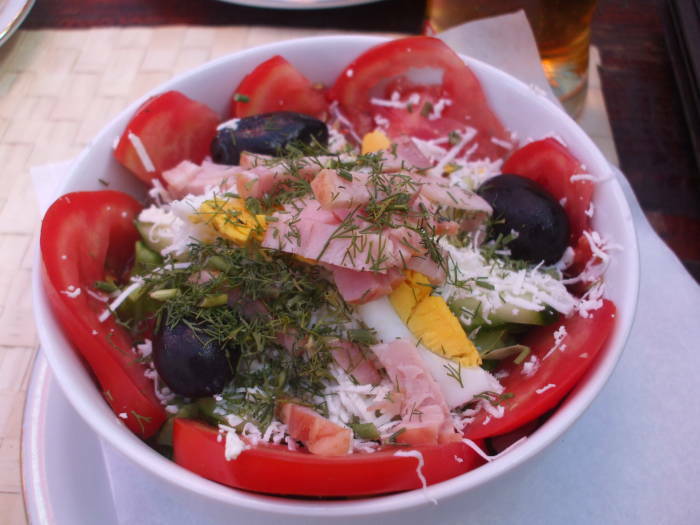 This salată asortată has both tomatoes and cucumbers, with onions, and with egg, ham and cheese added. Plus dill and olives. Salată roşii would be just tomatoes with olive oil, salată castraveţi would be just cucumbers and olive oil. 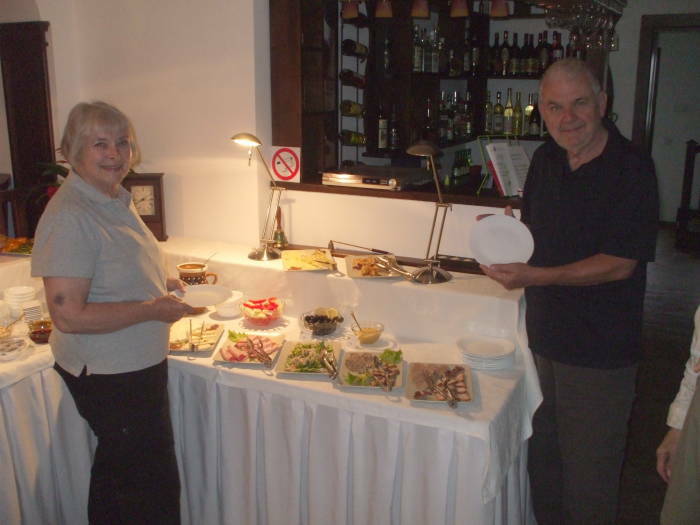 Here we each got a salată asortată and we will share the sandwiches and french fried potatoes. This is at a restaurant with outdoor tables along the street in Bucharest. 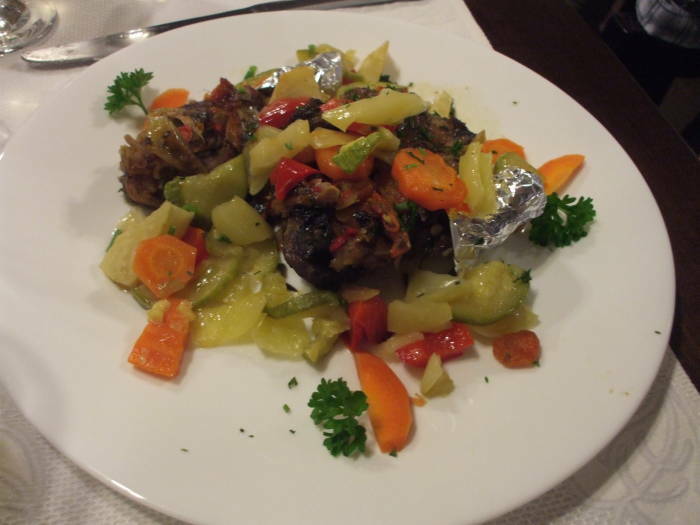 Here is a dinner of grilled meat and mixed vegetables at the wonderful Hilde's Residence in Gura Humorului. 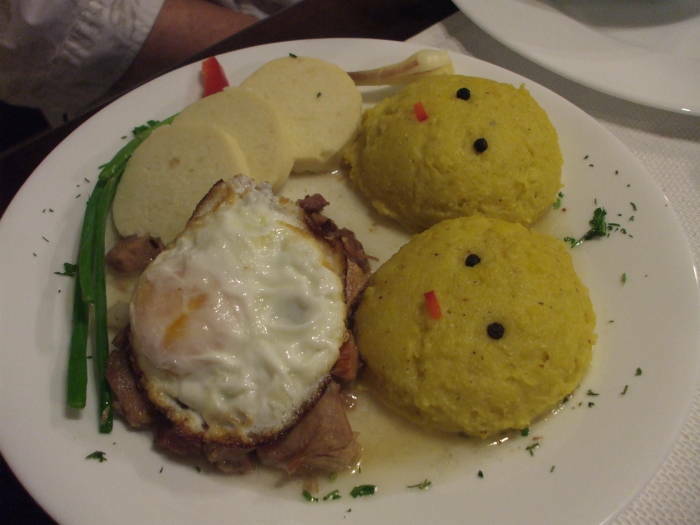 Meat with an egg, and two scoops of the distinctive Romanian speciality mămăligă. Two black peppercorns and a small piece of carrot make a face of each. 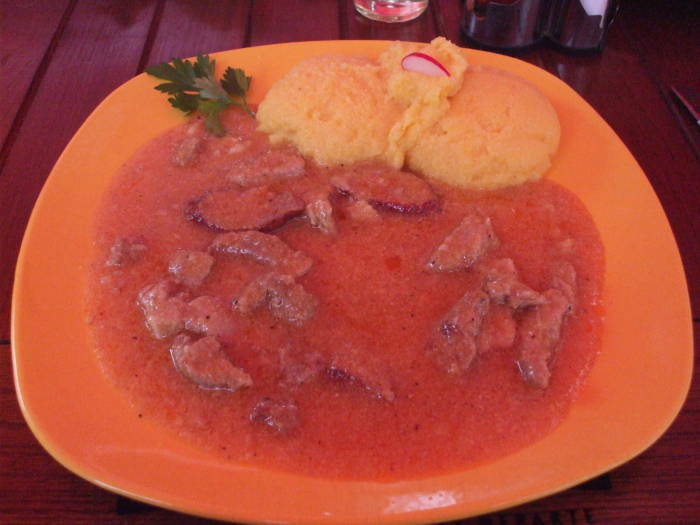 Mămăligă is similar to the Italian polenta. It is a thick porridge made from yellow maize flour (what Americans now call "corn"). 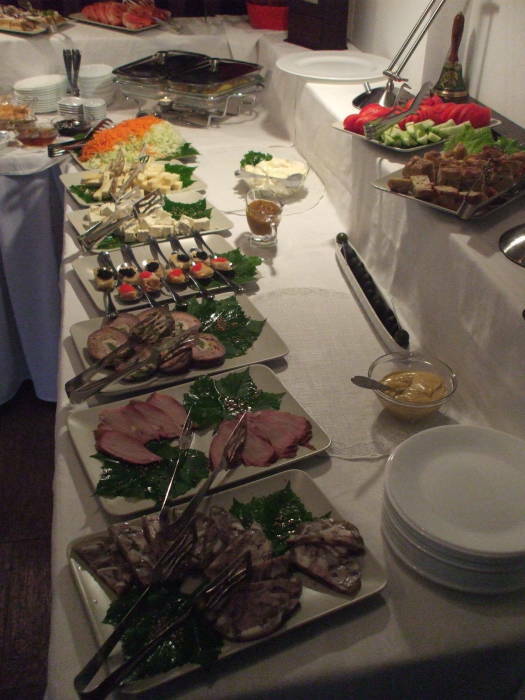 Mămăligă was traditionally viewed as peasant food, a substitute for bread or even a staple then times were tough. During the time of Roman control of this territory, porridge was made from millet flour, what the Romans called pulmentum. The Romans ate so much of this that the Greeks called them πυλτιφαγονιδες or pultiphagonides, the porridge eaters. Hernán Cortés brought maize from Mexico to Europe in the 1500s. It was being grown in Romania by the early to mid 1600s. Maize took the place of millet in the mămăligă. Gura Humorului is in the eastern edge of the Carpathian Mountains. 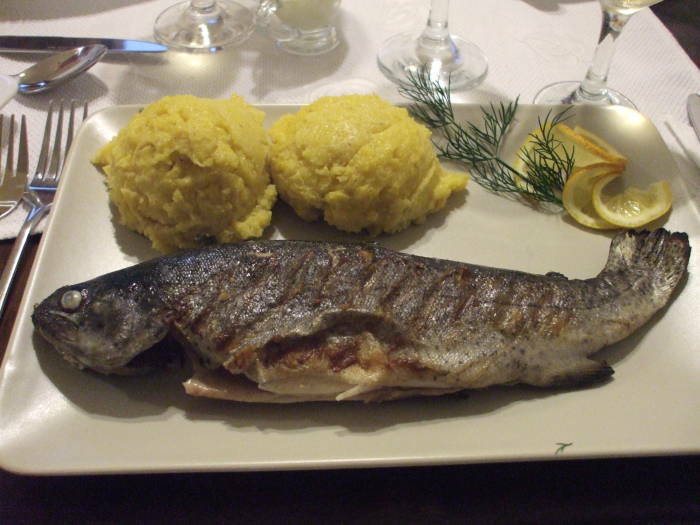 Grilled local trout is a delicacy. I had for breakfast more paprika, and a sort of porridge of maize flour which they said was "mamaliga", and egg-plant stuffed with forcemeat, a very excellent dish, which they call "impletata". 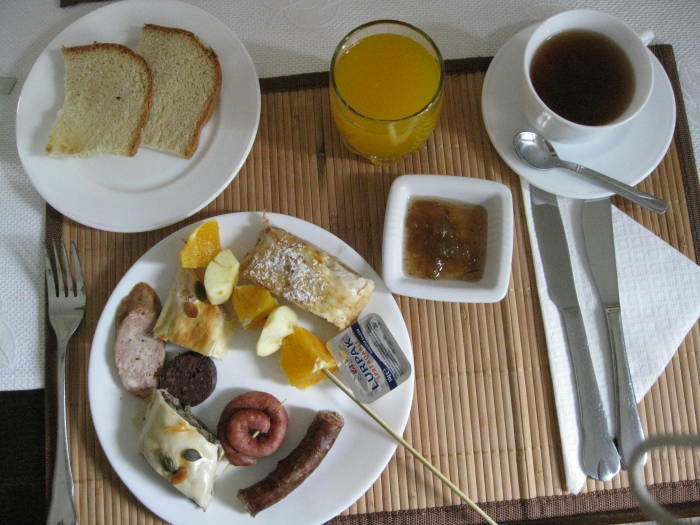 Breakfast would include a variety of cured sausages, some of them spicy and some not. Plus fruit, pastry, bread with jam and butter, juice and coffee or tea. 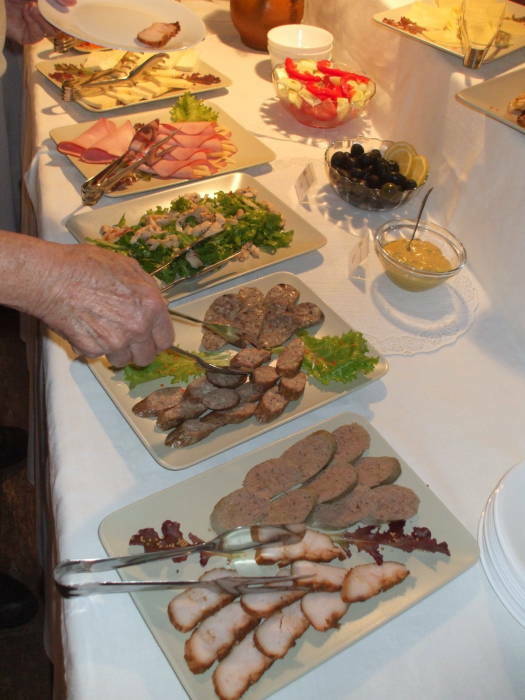 Romania has a wide variety of meats and sausages. Pastrami is actually a Romanian word. Hilde's meals were amazing. 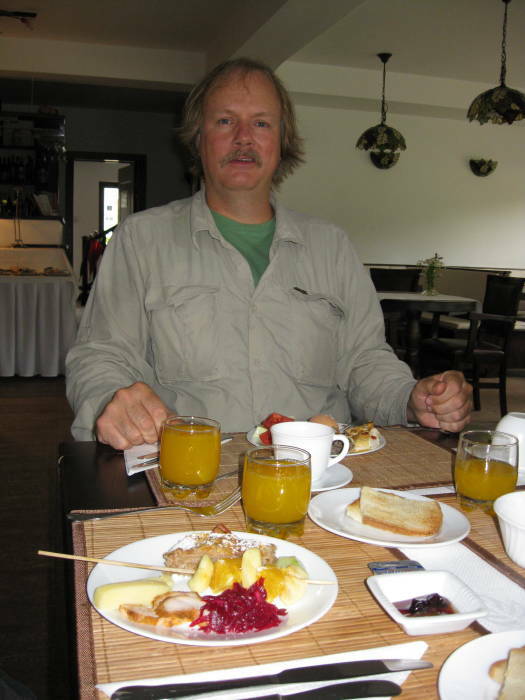 Every morning there was a slightly different enormous buffet breakfast. 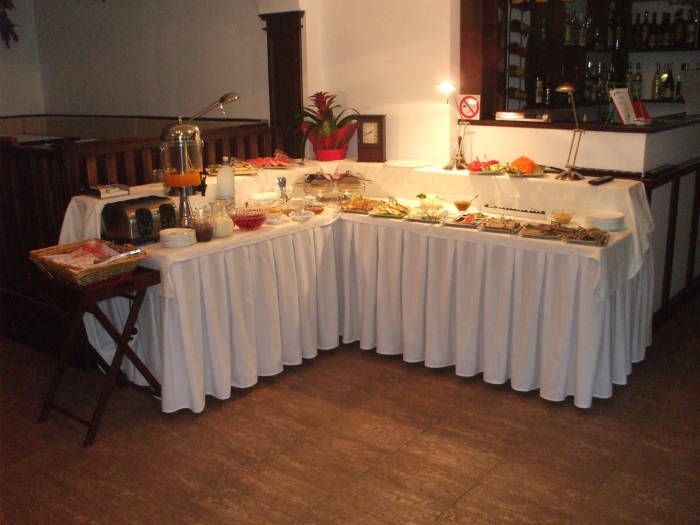 And the next morning, the buffet would feature a different array of delicious food. I had no idea that our lodging would be so opulent! Hilde's would have to be described as a "boutique hotel". Each of the rooms was decorated in a different style. This would be the sort of place where movie stars would vacation (and pay movie-star prices) if it's weren't for the fact that Bucovina overlaps the Romanian-Ukrainian border in the northeast corner of the country, a full day's journey by train from Bucharest. The glass dishes at rear have eggs, fried and scrambled. Shredded cabbage and carrots at center. Slices of local cheese in the foreground. 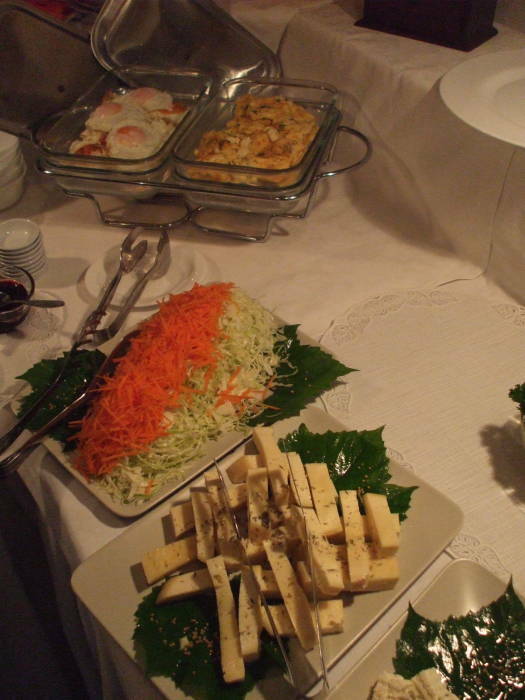 There are several types of cheese. Brânză is a salty cheese made from sheep's milk. 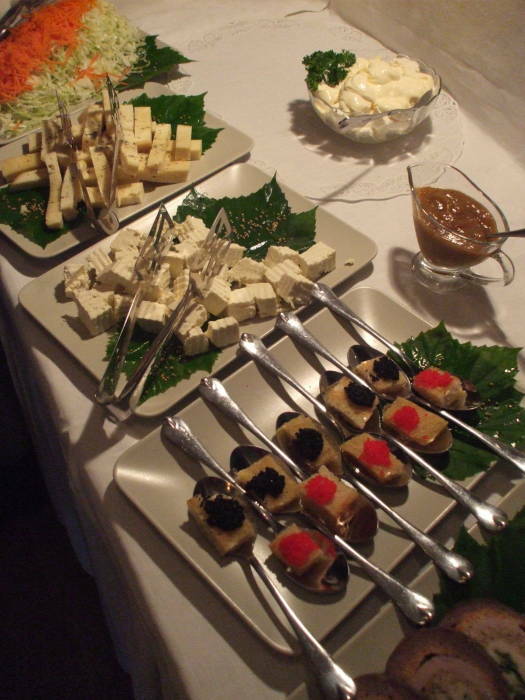 And yes, the spoons hold small pieces of bread with black and red fish roe. Caviar at breakfast! 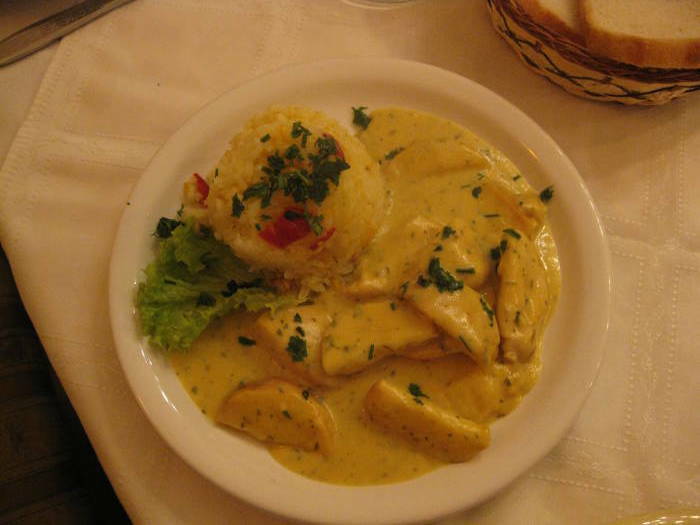 Romanian cuisine certainly features meat. Here are two versions of meat encapsulated inside meat. In the far dish, it's vegetable paste inside meat inside meat. 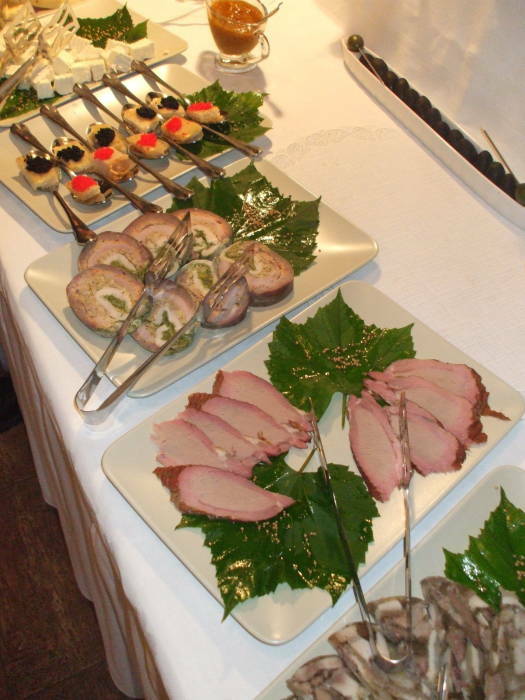 Notice the large maple leaves on the dishes. After driving from Gura Humorului through the Carpathian Mountains, we had this spicy ciorbă in Bistriţa, in southeastern Maramureş. Here they have garnished the mămăligă with a slice of radish. 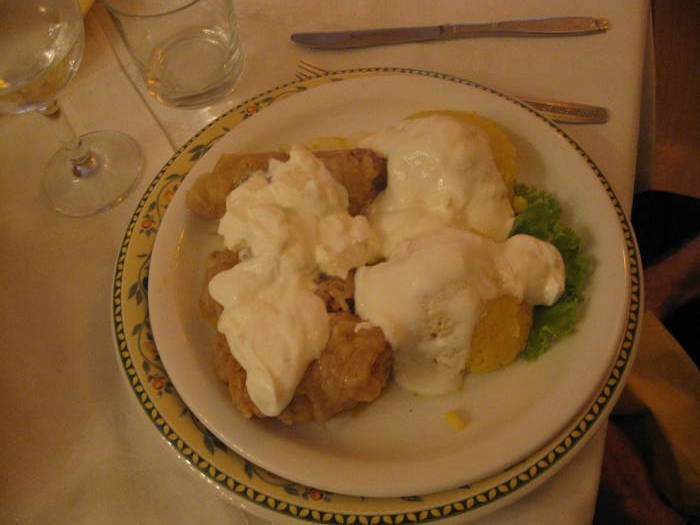 We continued south to Sighişoara in Transylvania, where we had this dish of meat with sour cream. One last serving of mămăligă before taking the overnight train to Budapest. 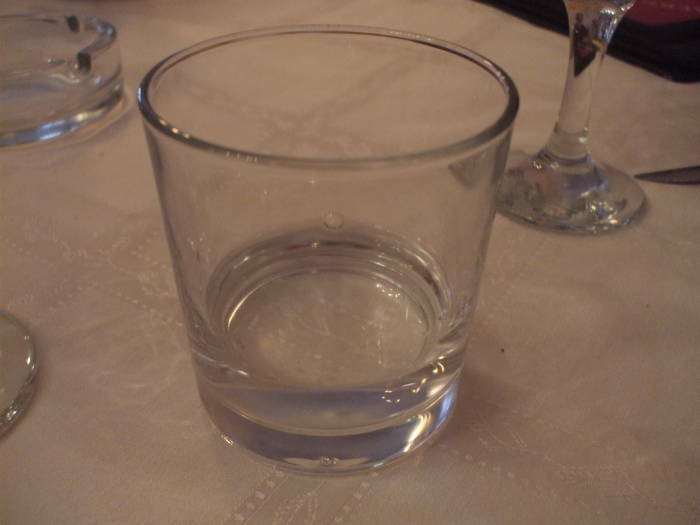 Ţuică is the national speciality in hard liquor. 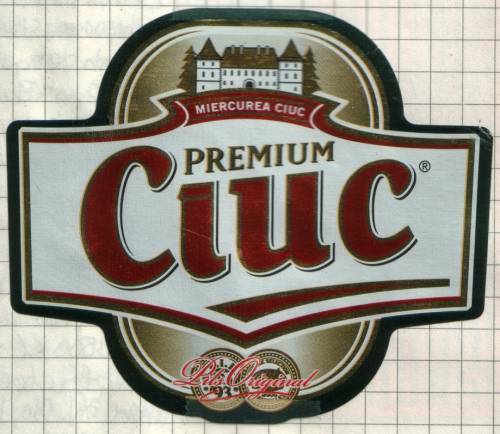 Ţuică nominally means plum brandy, but it can be distilled from any fermented fruit drink. 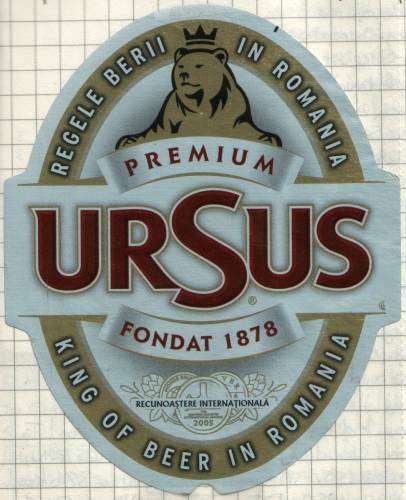 Romania produces a lot of wine, going back to its heritage as Roman Dacia. Both red and white wine are produced in at least five distinct regions in Romania: northern Moldavia, southern Moldavia, Transylvania, near the Black Sea coast, and south of the Carpathians.